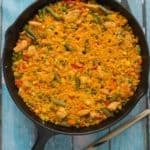 This Chicken with Rice Spanish Style is a burst of mouthwatering flavors with each bite! It comes together in a flash and requires only one pot. Perfect weeknight meal that the whole family will love. In a large skillet over medium heat, heat 2 tablespoons of oil. Saute onion, peppers, garlic and green onion for 3-5 minutes, or until onion is translucent. Remove from pan and reserve. In the same skillet, add 1 tablespoon of oil and cook the chicken for 8 to 10 minutes or until chicken is lightly browned. Remove from the pan and reserve. In the same pan, add 1 tablespoon of oil. Add the rice and toast for 1 minute, stirring constantly. Add chicken broth, onion mixture, cooked chicken, saffron (or seasoning) and mix well. When the saffron is well blended, add the vegetables; mix. Cook, over medium-high heat, until most of the liquid has evaporated. When the liquid has evaporated cover, reduce heat to low and cook for 15-20 minutes or until rice is tender. If you do not find/have the saffron you can use an envelope of this seasoning mix that is easy, and cheaper, to buy in any grocery store. If you want you can use bone-in chicken, but the cooking time have to increase to make sure the chicken is cooked through.